This time of year it seems right to give a shout-out to those most welcome arrivals in my vegetable garden- the volunteers. These are plants that have either wintered over from the year before, no small feat in an eastern Ontario garden that freezes solid for months on end, or offspring from plants that have left their seeds behind from the previous season. Some volunteers are planned. After harvesting garlic in early August, I sow spinach in the patch and let it over-winter. A cool spring this year has given multiple spinach harvests, and since I routinely miss harvesting a few small garlic heads, there is fresh garlic too, coming up like thick leeks. Last night fresh garlic was warmed in sour cream, and then stirred into spinach and served on toast for a quick supper. The kale overwintered as well, and those early spring greens are just the right tonic this time of year. To get self-seeded plants, it pays to be a lazy (I prefer laissez-faire) gardener. When greens like lettuce or arugula bolt, let them be until the fall, and early salads are guaranteed. Last year I let a parsnip go to seed, because I wanted to see what a parsnip flower looks like. 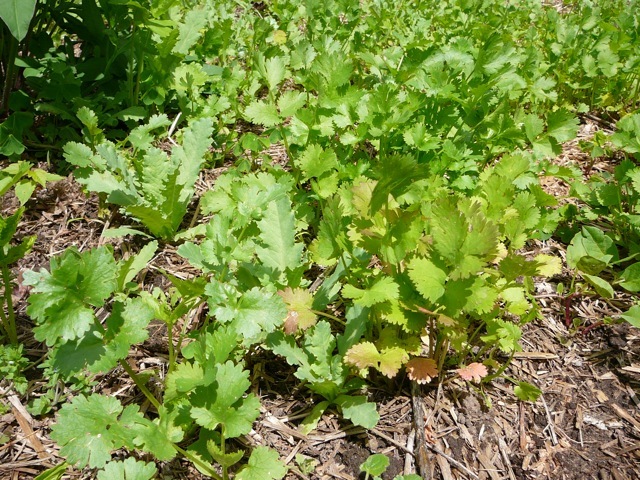 A lush forest of bright green, ferny growth this spring demanded some quick thinning, but now I have a good size crop of parsnip already underway, and probably far earlier than I would have considered planting it. That's one of the beauties of volunteers. They have their own seasonal wisdom. If the seeds sprout, the time is right. Sure there are drawbacks to volunteers. If you need the space, letting old plants hang around until they set seed may not be practical. And this system is not for those who like to till their garden to bare earth each spring. Sometimes volunteers show up in awkward spots, particularly when they try to colonize the perennial flower beds, and often need agressive thinning. Tomato seedlings can easily become weeds if left unchecked. But there can be some wonderfully serendipitous results in just letting plants do their own thing.